Frain has hundreds of labelers in stock ranging in price from $2,000 to $139,000. Depending on your product, speed and container, Frain engineering can select the best labeling machine for your application.Labels come pre cut and on rolls and can be applied in many different ways. There are spot labelers, wrap-around labels, roll-through labelers, hot and cold glue labelers, pressure sensitive labelers, heat sensitive labelers, hot melt glue labelers, sleeve labelers, heat shrink labelers, and many more.Labeler considerations are the purpose of the label, the size, shape and surface of the container, the materials, heat resistance type of adhesives, etc. Krones, Model Rotina, automatic, inline, cold glue spot or wrap labeler, rated from 10 to 100 containers per minute – depending on materials, application and machine configuration. Container size range: 2” to 6½" in Diameter; minimum of 3¼" in Height. Label size range: 2¼” to 14” in Length; 1" to 9"" in Height. Equipped with 94" long x 4½" wide Delrin belt conveyor, worm screw in feed, pre-cut sheet stock label magazine, 9¼" high glue wheel system and 26" long x 9¼" high wrap station. Mounted on base frame with height adjustable legs and casters. Some change parts are required to accommodate different size range. Label Aire, Model 3115, automatic, inline, pressure sensitive wrap labeler rated to 1,500" per minute with number of product – depending on materials and application. Label size range of: 0.5" to 11" in Length x 3/4" to 7" in Width. Equipped with 92" long x 6" wide plastic Delrin product conveyor, 8" high peeler plate 24" long x 8" high wrap station. Label Roll: 12"OD on a 3" core. Mounted on heavy duty base frame with casters. New Jersey, 400R FINALTOUCH, tamp on labeler. Rated from 10 to 50 labels per minute – depending on materials, application and machine configuration. Label size range: 1" to 4" in Height; 2" to 10" in Length. Label specifications: up to 14" in Diameter on 3" core. Configured for horizontal label application. Equipped with a 91" long x 12" wide belt conveyor, top squaring belt, SATO printer and controlled by an A/B PLC with A/B 550 panel view. Mounted on adjustable height stand. Krones Model 747-442 Autocol, automatic, 30 station, stainless steel, rotary, front, back and neck pressure sensitive labeler rated from 30 to 800 containers per minute – depending on materials and application. Container and label size range per application. 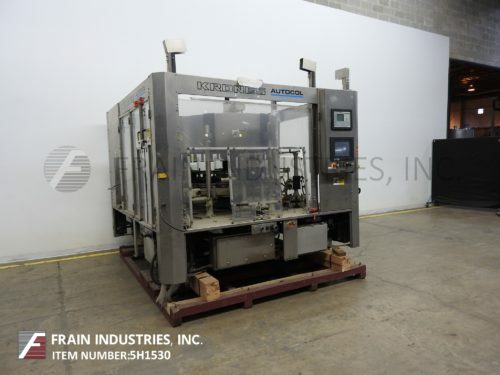 Equipped with star wheel in feed and discharge with 2 or 3 labeling heads, label unwind stands for continuous operation of wraparound, three panel or spot label applications with no container / no label senser and (30) 5" OD pedastal container stations set on 5-1/2" centers with top hold down and brushes to wipe down labels, Label head can handle maximum label reel of 18" OD on 3" OD core. Control panel, has touch pad controller with panel view, start, stop, e-stop push buttons, statis light bar, safety guarding and hand held e-stop. Mounted on stainless steel heavy duty base frame. Aesus Model Delta, automatic, single or dual side servo driven, stainless steel, empty pre-made pouch labeling system with number of labels per minute – depending on materials, application and label applicator. Equipped with dual pouch elevators both have 24" long x 3-1/4" wide vertical pouch transfer belts with 2-1/4" x 2" long pouch carriers on 6" centers, to 52" long dual eagle belt pouch in feed belt. Herma Model H400-16L top labeler applicator (and can run with bottom labeler also). has standard labeling speeds up to 130 feet per minute with number of pouches per application. Label widths to 6.3" with accuraces of + / – 0.01". Has 12" OD label reel and 7" OD rewind reel with 7" peel plate and 8" top / 9" bottom compression rollers has touch pad controller with read out and 30 pre-set functions, hand crank adjustable and 10 x 12 pouch catch bin. Control panel has A/B PLC and A/B touch pad controls with read out and elevator up / down main counter and send signal to the label applicator. Mounted on stainless steel base frame. New Way, Model E5, automatic, roll through, hot glue, wrap labeler. Rated 30 to 300 labels per minute – depending on materials, application and machine configuration. Container size range: 1-3/4" to 4-3/8" in Diameter; 1-3/4" to 8-3/4" in Label Height. Equipped with dual container handling belts, hot glue pot with direct contact wheel applicators, single mechanical label feed magazine and roll on label application section with compression brushes and cold glue lap seal. Mounted on base frame with locking casters. Krones Autocol automatic, in-line, pressure sensitive labeler capable of labeling from 50 to 300 containers per minute – depending on materials and application. Containers: 2" to 6" in diameter; 2" to 18" in height. Labels: up to 6-1/4"W. Equipped with 3-1/4" conveyor, dual worm screw in feed, 48" top container hold-down, dual label roll unwinds with manual splice station, 24"L x 4 1/2"H foam compression out feed, E-stop and Allen Bradley PLC. Stainless steel frame with height adjustable legs. Hot stamp coder available at additional cost.